Just a few decades ago, Ethiopia was a country defined by its famines, particularly between 1983-1985 when in excess of half a million people starved to death as a consequence of drought, crop failure and a brutal civil war. Against this backdrop, it is impressive that in recent years, Ethiopia has been experiencing stellar economic growth. The headline statistics are certainly remarkable: the country is creating millionaires faster than any other in Africa; output from farming, Ethiopia’s dominant industry, has tripled in a decade; the capital Addis Ababa is experiencing a massive construction boom; and the last six years have seen the nation’s GDP grow by a staggering 108 percent. But it is not all positive news, because for all the good figures there are still plenty of bad ones. Around 90 percent of the population of 87 million still suffers from numerous deprivations, ranging from insufficient access to education to inadequate health care; average incomes are still well below $1500 a year; and more than 30 million people still face chronic food shortages. And while there are a number of positive and genuine reasons for the growth spurt – business and legislative reforms, more professional governance, the achievements of a thriving service sector – many critics say that the growth seen in agriculture, which accounts for almost half of Ethiopia’s economic activity and a great deal of its recent success, is actually being driven by an out of control ‘land grab’, as multinational companies and private speculators vie to lease millions of acres of the country’s most fertile territory from the government at bargain basement prices. At the ministry of agriculture in Addis Ababa, this land-lease programme is often described as a “win-win” because it brings in new technologies and employment and, supposedly, makes it easier to improve health care, education and other services in rural areas. “Ethiopia needs to develop to fight poverty, increase food supplies and improve livelihoods and is doing so in a sustainable way,” said one official. But according to a host of NGO’s and policy advocates, including Oxfam, Human Rights Watch and the Oakland Institute, the true consequences of the land grabs are almost all negative. They say that in order to make such huge areas available for foreign investors to grow foodstuffs and bio-fuels for export – and in direct contravention of Ethiopia’s obligations under international law – the authorities are displacing hundreds of thousands of indigenous peoples, abusing their human rights, destroying their traditions, trashing the environment, and making them more dependent on food aid than ever before. But the most controversial element of the government’s programme is known as ‘villagisation’ – the displacement of people from land they have occupied for generations and their subsequent resettlement in artificial communities. In Gambella, where two ethnic groups, the Anuaks and the Nuers, predominate, it has meant tens of thousands of people have been forced to abandon a traditional way of life. One such is Moot, an Anuak farmer who now lives in a government village far from his home. Despite growing internal opposition and international criticism, the Ethiopian government shows no sign of scaling the programme back. According to the Oakland Institute, since 2008, an area the size of France has already been handed over to foreign corporations. Over the next few years an area twice that size is thought to be earmarked for leasing to investors. So what does all this mean for the people on the ground? In Ethiopia – Land for Sale, filmmakers Veronique Mauduy and Romain Pelleray try and find out. 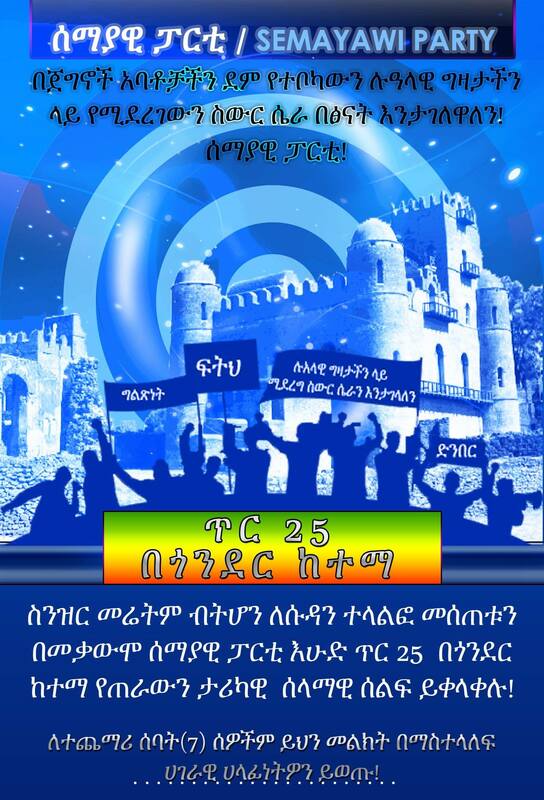 ዓመት በፊት ተመስርቶ ወያኔን ያንቀጠቀጠውን የኢትዮጵያ ህዝብ ብሔራዊ ዴሞክራሲያዊ ዘብ ጋር በመዋሀድ በአንድ መጠሪያ የኢትዮጵያ ህዝብ አርበኞች ግንባር ዘብ በሚል ትግሉን በማካሔድ ላይ ይገኛል፡፡ ይህ የተደረገበት ምክን ት ምንድነው ከሚለው ብንጀምርስ? ጎህ፡-በአሁኑ ሰዓት የድርጅቱ እንቅስቃሴ ምን ይመስላል? ጎህ፡- ወያኔን ከሚታገሉ ሌሎች የፖለቲካ ድርጅቶች ጋር ያላችሁ ግንኙነትስ ምን ይመስላል? ጎህ፡- በአሁኑ ሰዓት ያለውን የአገራችን ወቅታዊ ሁኔታ እንዴት ይመለከቱታል? ጎህ፡- አቶ ልዑል ይህ ሁሉ ተባለ፡፡ እንዲያው እስካሁን ባሳለፉት የትግል ጉዞና ተሞክሮ በመነሳት የወያኔን ቡድን እንዴት ይገልፁታል? ጎህ፡- ከዚህ በፊት ኢትዮጵያ ሶስት የባህር በሮች ነበሯት፡፡ በአሁን ሰዓት ከሶስቱም የባህር በሮች አንድ እንኳ የላትም ይህን ጉዳይ ድርጅታችሁ እንዴት ያየዋል? 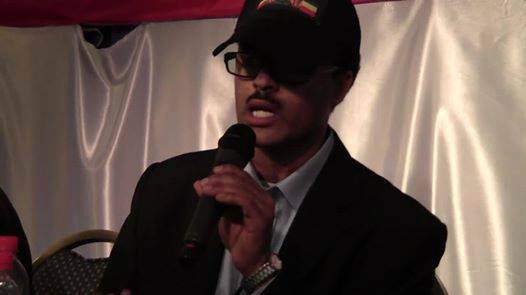 ወደፊትስ አገሪቱ የባህር በር እንዲኖራት ምን መደረግ አለበት ብሎ ያምናል? ጎህ፡- በመጨረሻም የሚያስተላልፉት መልዕክት ካለዎት? በቅርቡ በፌስቡክ ላይ አንድ አውቀቱ ይሁን ጤንነቱ፣ ወይም ኪሱ የተቃወሰበት ሰው በትግርኛ ስለማንነት ጽፎ ነበር፤ ከዚህ በፊትም ጽፎ አስተሳሰቡ ሁሌም የተወላገደ በመሆኑ አልፌው ነበር፤ አሁን ደግሞ ሲጽፍና በአንዳንድ የሱ ቢጤዎች አበጀህ! አበጀህ! ሲባል ሳይ አደገኛነቱን ተገነዘብሁ፤ አንዱን ጎባጣ ሀሳብ ቶሎ ካላስተካከሉት ብዙ ጎባጦችን ያፈራል፤ የተጣራና ቀና የሆነ ሀሳብን ለመግለጽ በጣም ያስቸግራል፤ ማሰብ መጨነቅን፣ ማበጠርን፣ ማጣራትን ይጠይቃል፤ አፍ እንዳመጣ መልቀቅ ቀላል ነው፤ በተለይ የሚዳኝ ከሌለ! ኢትዮጵያዊነትን ለማጥፋት የሚደረገው ሙከራ አዲስ ኤደለም፤ ኢጣልያኖች በሰፊው ዘርተውት የሄዱት ጉዳይ ስለሆነ የአባቶቻቸውን ውርስ የሚከተሉ ዛሬም ይኖራሉ፤ ኢትዮጵያዊነትን ለማጥፋት ብዙ ገንዘብና ሌላም የሚከፍሉ ብዙ የተለያዩ ድርጅቶች መኖራቸው የታወቀ ነው፤ ዱሮ የኢጣልያ ወኪሎች ተጠቅመውበታል፤ ዛሬ ደግሞ ሌሎችም ተጨምረው ያንኑ ተልእኮ የሚያራምዱ አሉ፤ በየዋህነት እንደበፊቱ እንዳናስተናግዳቸው እንጠንቀቅ!